HAPPY BIRTHDAY #SUNDAYSUPPER, YOU ARE ONE YEAR OLD!!! Congratulations to Isabel for creating such a wonderful group that is now celebrating a little milestone, it’s first birthday celebration!! This is a wonderful group of people that are so strongly supportive and generous. A group that I am proud to be part of. A group that has the mission to bring families and friends together again around the supper table, something that so many have lost in our quick paced crazy lives. This mission is being seen, sought after and recognized for it’s significance in bringing us together again. It is making a positive impact on people lives. It starts off as one day a week and soon becomes a way of life. We have now started to do #WeekDay Suppers also and you will see that from time to time on here also. To celebrate this birthday we were asked to pick one recipe from another of the #SundaySupper participants that has inspired us. Well that list is a long one and I only started a few short months ago. So many wonderful contributors and only one to pick!! The one I picked was fairly simple. Something that brings you together to share, as a family around the table or watching a big game on TV!! 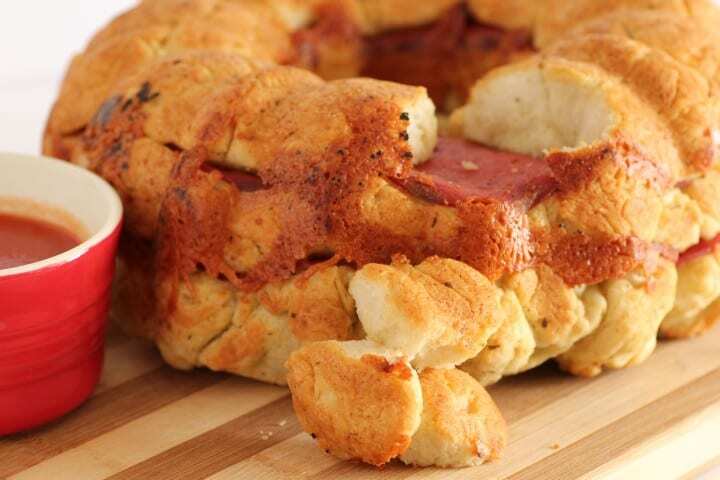 Something fun that everyone really enjoys, the flavors of pizza are found in this easy pull apart bread. Something that I have never made before. I chose this recipe Pepperoni and Mozzarella Pull Apart from Karen’s site, In The Kitchen With KP. 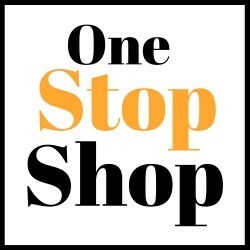 A great site filled with wonderful ideas and recipes. We are actually doing her 52 Week Money Saving Challenge, but in 52 Days to save for vacation. Now that will be challenging!!! Karen inspires me as she is a very busy gal with work, two kids and a blog. Not quite sure how she does it all!! She has great recipes like Meatloaf Muffins Equal Fun Sized Dinners. She has wonderful informative posts like How your Smartphone Can Save You Money. All in all a fabulous family site that you will love to poke around on. I have been laid up as of late, finding it hard to walk with my arthritis so Ken went into the kitchen for me and made this wonderful pull apart bread. We all loved it and devoured it over lunch and dinner. Yummy!! A great pull apart bread for the whole family. For the dough, in a medium bowl, dissolve yeast and sugar in warm water. Mix well and then stand for about 10 min. until it is creamy. Stir in the flour, salt and oil. Beat until smooth then let it rest for 5 minutes. Preheat oven to 375F. Separate pizza dough into small bite sized pieces. Toss dough in the flavored oil to lightly coat. Layer the dough into a bundt pan sprayed with cooking spray. Next layer in half the pepperoni, shredded cheese and garlic powder. Repeat layers again and end with dough pieces. Bake for 30-40 min. until golden brown. Remove from oven and invert onto a cutting board. Serve with your favorite pizza or marinara sauce for dipping. Aww Tara, I’m sorry to hear you haven’t been feeling well but huge props to Ken for making this glorious, golden pull apart bread! It looks simply fabulous – if I could reach through my screen to grab a chunk (oh who am I kidding? I could eat this entire thing!) I would. It’s been a pleasure getting to know you through this wonderful group. I hope you feel better soon! Thanks so much Nancy, little by little the days are getting better. I am so glad I can rely on Ken to help me in the kitchen!!! I am very impressed that you got your husband to do your blog baking for you! What a great guy and his pepperoni bread turned out beautifully. While I was trying to decide which recipe to make this week, one of my short-list ones was your seafood chowder but, unfortunately, I didn’t have time to make it before Wednesday and decision time. I did make it last night though and it was fabulous! I hope you feel better and are back on your feet soon. Thank you so much Stacy, I am so glad you made and liked the seafood chowder!! That made my day. Thanks for coming over and Happy Sunday Supper!! Thanks Veronica for coming over, it really is a good recipe!! Thanks so much Laura, each day is getting a little easier!! Wow, this is an awesome bread, and so simple to make! It has wonderful flavors. And you have a great husband Tara. Hope you feel well very soon! You are all so kind and thank you so much Paula. It really is a great recipe!! Looks so good and easy to make! Beautiful photos! Thanks so much for coming over Amy and for your well wishes. I do hope you’re feeling better – gorgeous bread…kudos to your hubby for baking it up! He is a very good hubby and I am blessed!! Thanks Pam. Yum! I made something similar earlier in football season and it was a huge hit. I love that you can just break off what you want-makes for a fun party appetizer! I hope you feel better soon but props to your husband for making this for you! Thanks so much for coming over and yes it is so perfect for the football season. I will have to make it again with Super Bowl coming. I have made this bread many times since Karen posted the recipe. I can vouch for how delicious it is! It is now a must at all of our game viewing parties. It is great isn’t it Lane, thanks so much for coming over!!! Lookin good Tara! This would be great for any party! It sure would be great for any party, a real crowd pleaser!! OH Tara I do hope you feel better! I had the flu last week and am still dealing with the leftovers of that dang bug! Kuddos to hubby for stepping up to the plate for you. I don’t even want to know what it would look like if Kevin had to cook for me. Sssshhhh don’t tell him I said that. He is a wonderful guy just not so great in the cooking dept LOL Thanks for posting this fab recipe!! Ken is great in the kitchen and makdes wonderful meals. He is game for trying anything and a big help always!! Thanks for the well wishes!!! Thanks for coming over, it has been a bad year for the flu here in our city, lots of people are sick!! Your kidlets would love this for sure!! Yummy! My Husband would go bonkers for this pull apart bread!! Thanks for coming over Jennifer, you will have to make it for him sometime!! What a wonderful bread! It sounds like a fun thing to make and share. Hope you can get back to making lovely things soon – feel better! Thanks so much Katy and for coming over!! Pull Apart Bread is on my list of things I want to make this year. Love the pepperoni version, my family would surely enjoy it! Thanks for coming over Erin, this has inspired me to try more of these breads, never made them before!! How sweet of your husband to make that for you. I could sit and munch on it for a long time. I think my husband would love it too. He is a great hubby and we all so enjoyed that bread!! oooooo I LOVE the pictures!!! We love making that bread! Thanks Angie, it is a great bread!! Thank you for being such a big part of #SundaySupper… your recipes are always amazing. I am so sorry that your arthritis is acting up. You have one talented guy! Wow…. he made this recipe look amazing! Thanks Isabel, I am feeling better each day now after having treatments, I am so glad I can rely on the “big guy” to help me pull it off!! An easy meal anyone can make! I love that it uses real dough instead of wack em on the counter biscuits. Must try this for pizza night soon. Perfect family pizza night meal!! Thanks for coming over!! My husband has a hard enough time making a box of macaroni! I’m so impressed that your husband pulled this off – it looks delicious! Yes my hubby is good in the kitchen and I am blessed. Thanks for coming over Amanda!! I’m sorry you haven’t been feeling well. I have arthritis too, so I know how you feel. Rest easy and I hope you start feeling like yourself again soon! Your husband did a great job on this bread! It looks incredible! Great for a party! Thanks Susan, each day I am feeling better after having treatments. It has been a hard month and half but getting better and I am back in the kitchen now!! This turned out beautifully, he did a fabulous job. It’s on my to-make list, as well…I know it would be something the whole family would love! Such a simple idea but so good, thanks for coming by Heather!! What a great husband to make this for you–and do such an amazing job at it. It looks perfect! I hope you’re on the mend and feeling better soon! Feeling better each day, thank you. He sure did a great job!! That was great of your husband to step up. My wife made dinner for me last night as I’m out with the flu hitting me hard the last 2 days. It’s always great having a supportive spouse. I couldn’t do it without him!! Hope you feel better soon Chris!! Awww….thanks, Tara! Your post made me feel all warm and fuzzy inside! I am happy you tried the pepperoni pull apart. It is one of our favorites for football Sunday and parties. Thank you for sharing it. Your pictures totally put mine to shame and are gorgeous! Thanks Karen, it is a great recipe and we so enjoyed it. Happy #SundaySupper!! Oh this looks fantastic! !Love pull apart bread and its even better when your other half bakes it for you 🙂 Hope you feel better soon! Thanks so much Soni for coming over and for you well wishes!!! I love this recipe! It looks delicious!! and thank you for sharing the 52 Week Money Saving Challenge!! I’m going to check this out! What a great way to save vacation. Love this!! Oh, you reminded me that I need to put my money in for today!! Happy #SundaySupper!! Thanks so much for coming over Conni!! Your husband did this??!! I’m so impressed!! Mine… just pasta whith already-made tomato sauce… Looks so tasty!! Ken is great in the kitchen, we are in there together all the time!! What a fun recipe!! And if hubby can make it, anyone can, right?! 😉 Unless your hubby is better in the kitchen than mine (though mine is a pretty mean grill-master!). I have to say Ken is very good in the kitchen, taught him everything I know!! In saying that it is pretty easy recipe for anyone to pull together. If you find pizza dough it would be even easier!! I had a hard time making it through all the recipes today. Everything looked so good. I had to stop to go and eat!! Thanks for coming by Anne! Looks beautiful. Beats pizza !! NICE husband ! Always good to have a helping hand ! Mine helps too & its so good ! It is always great having help in the kitchen!! Love this recipe! It looks positively delicious! Easy to see myself with this and a glass of Sangiovese! Thanks so much for coming over Martin!! Thanks so much Liz and thanks for coming over!! Thanks so much Lyn, it is a great bread to share!! Ken did do a great job!! Oh my gosh, this looks crazy good. Karen really has a great recipe!! Thanks for coming over Jennie!! I have been wanting to make this pull apart bread for the longest time. How sweet that your Hubby did the baking for you! Hope you are feeling better. Thanks for coming over Leslie, he did a good job too! Hehe Prince Charming!!! We are off to the Happiest Place of Earth. Hence needing loads of money!!! Great idea, I’m going to try this and flavor the dough. Good idea to flavor the dough!! I’ve made sweet pull apart breads but I think I may enjoy the savory better. Who doesn’t love cheese and bread. Yummy! Looks fantastic Tara. I have never made sweet pull aparts before now I will have to venture there!! Looks so nummY! I can’t believe I didn’t see it before! Thanks for coming over Sarah, it is so good!! 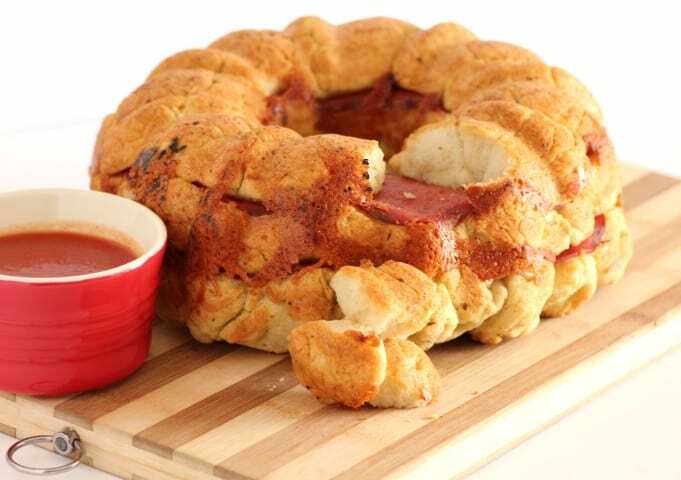 Tara, you have inspired me to try this wonderful Pepperoni and Mozzarella Pull Apart too. Its look wonderful! Hope you feeling better now! I hope you enjoy it as much as we did Faye. Enjoy! !